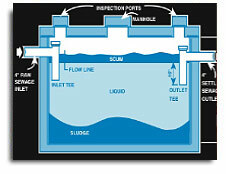 How a septic tank works. A T-shaped outlet baffle on the outlet pipe prevents the sludge and scum from leaving the tank and clogging the drainfield area. If the outlet baffle of your septic tank does not have a filter, it is recommended to have one installed for added protection of your drainfield. What kind of bacteria grows in a septic tank? Septic tank uses anaerobic bacteria to digest the solid waste. Anaerobic bacteria is capable of living or growing in an environment lacking free oxygen. 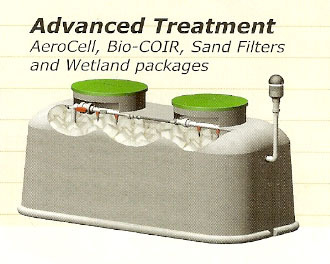 Many septic systems today are constructed using advanced treatment systems or Aerobic Treatment Units (ATU's). The primary difference between how a septic tank works and an ATU or advanced treatment system works is bacteria. Advance treatment systems and ATU's use aerobic bacteria to digest the solid waste. Aerobic is the opposite of anaerobic. Aerobic bacteria requires an ample supply of free oxygen to live and grow. How is my septic tank constructed? The septic tank is buried watertight container typically made of concrete, fiberglass, or polyethylene. Septic tanks are constructed with one and two compartments. The perceived benefit of a two compartment tank is that more particles will settle out of the effluent in the second compartment. The influx of wastewater will not disturb the settling process in the second compartment. Understanding how a septic tank works and how it is different than an aerobic treatment unit is an important first step in understanding how all of the components of your septic system work together. Septic tank . . . primary treatment of wasterwater.ATU or Advanced treatment system . . . secondary treatment of wastewater.Drainfield . . . final treatment by the soil and dispersal of the water back into the earth.The next step is to explain how a septic system works. To explain how all components of a septic system work together is a bit more involved. Why? . . . Because there are different methods of treating septic waste and disposing of the wastewater. Following are links to more detailed explanations of septic systems types and disposal methods. Contact Carl's for septic tank pumping or for more information about how a septic tank works. Will Septic Tank Additives Eliminate Pumping?